George R. R. Martin has become synonymous with Game of Thrones, so much so that it is often easy to forget that he had also written short stories and for television long before he became a worldwide sensation. 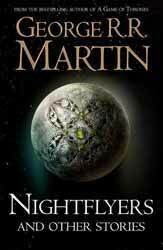 Nightflyers and Other Stories is a collection of his science fiction short stories. Although not explicitly acknowledged the reoccurrence of race names would indicate that, for the most part, the stories all share a common universe. The hardback volume contains six stories in all. I’m guessing that the publication of the book is not a coincidence as the SyFy channel is making a series loosely based on the titular story. The show is taking it as a jumping off place to produce essentially a science fiction haunted house story. I can understand why the story was optioned and it is the strongest of the collection. Martin is able to perfectly reflect the passengers growing fears and their hostility towards their captain. At first they think it may be the volcryn, then they think it is the captain and Martin keeps the reader guessing as to what is really going on until right near the end. I guarantee you it will come as a surprise. 'Override' (1973) is an earlier and less complex tale of revenge. Martin had yet to develop the labyrinthine plots for which he has become known. There are other stylistic elements which point to this being early on in a writers career as Martin reverts to that annoying practice of choosing names which while they may sound exotic do not particularly roll off the tongue. It’s a tale of struggle, back stabbing and revenge. On a far distant colony world, Kabaraijian and his crew mine for precious rocks. The peculiarity of the crew is that they are all dead and mentally controlled by Kabaraijian. Not good for any fine work they are ideal for the blunt and laborious task of digging out the gemstones. Not everybody is enamoured at the thought of a whole bunch of dead guys wandering about town and when Bartling finds a way of cornering the contract for the gems he lets the miners know that he intends to kick them off the planet. This set him on a collision course with Kabaraijian. 'Weekend in a War Zone' (1977) and instantly you know why Martin wrote for The Twilight Zone, as it could have easily been made into a television story. It’s another interesting aspect about Martin's work, just how visual it tends to be. Andrew Birch is a bitter little man, always jealous of his work colleague Stancato. Together with numerous others he volunteers to play in the weekend war games. These games are deadly, with death a real possibility. As we follow Birch through his weekend we see him getting increasingly paranoid and frustrated, which given that they have provided him with a gun full of live ammunition does not bode well for those around him. 'And Seven Times Never Kill Man' (1975) and if everyone has to have a Vietnam story then I guess this is Martin's. Like 'Override', it’s a straightforward narrative with a twist in its tale. The Jaenshi are a peaceful diminutive hominid tribal culture, seeming living at peace with their world. Each tribe gathers around a pyramid which contains their god. Unfortunately for them their planet has been settled by the Steel Angels, a fanatical human group who consider everything which is not human an animal. The power disparity between the natives and the invaders could not be more pronounced and the Jaenshi are being wiped out. neKrol, a trader on the planet cannot just sit back and be a witness to the slaughter and so finds an innovative way for the Jaenshi to survive. 'Nor the Many-Colored Fires of a Star Ring' (1976) and Martin combines both the philosophical ethereal with some hard science fiction. 'A Song for Lya' (1974) shows that as well as expansive ideas and far vistas he is also able to write genuinely touchingly poignant tales about the nature of love and just how well you can really know another human being. Shkeen is deceptive, the vast city of buildings look primitive, but it is a civilisation and people who have existed long before man started to civilise himself. The greatest cities of man are but a will o' the wisp in comparison. Lyanna and her husband have been invited by the new planetary administrator to investigate a disturbing occurrence amongst the population. He can read emotions, while she can read thought. The administrator is worried about the amount of humans who are joining the local religion, one which requires the adherents to offer up their lives to the Greeshka, a creature which kills and absorbs them. The two travel the city looking for answers. Overall, it’s a good collection and it’s interesting to go through some of Martin's early work. Like Game of Thrones he remains more interested in the human component of his stories rather than just providing fancy bells and whistles as stylistic distractions.